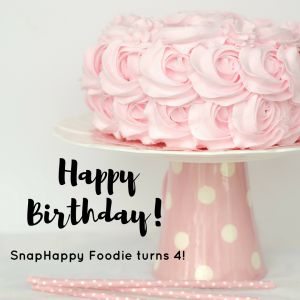 Home Baking SnapHappy Foodie turns 4! SnapHappy Foodie is now feisty four! Can you believe it? I’ve been blogging here for four years. Crazy! So what happened this year? Hubby and I attended food events such as the 2017 Newtown Food Truck Festival, as well as our favorites Westchester Magazine’s 2017 Wine and Food Festival’s Grand Tasting Village at Kensico Dam Plaza in Valhalla, NY, plus the 2017 Greenwich Wine + Food Festival. We checked out more restaurants like Le’s Kitchen, Le Madri, Bobby Q’s Cue & Co., Foundry Kitchen & Tavern, H & C Hawaii BBQ, Lobster Landing, Daddy Jack’s, Fatboy’s Kitchen + Bar, Muddy Waters Cafe, among others. In an attempt to share the results of my gastronomic research, I came up with lists like 8 Delicious Spots for Lobster Rolls in Maine & Connecticut, 8 Amazing Ice Cream Spots in Connecticut, 8 Spots for Hearty Noodle Soups in the NY Tri-State Area, and Balikbayan’s Must-Visit Restaurants in the Philippines. I also tried Home Chef, an awesome discovery that delivers meal kits packed with everything you need to cook tasty meals. Surprisingly, I only did one baking experiment for the year – Pavlova. Today's baking experiment, Pavlova, looks like an epic fail. Oh well! I had to stop baking because my doctor said. . . drum roll please. . . I am lactose intolerant. Yikes! He advised me to go dairy-free, which is pretty sad because most of the baked stuff I’m interested in have dairy. Of course, I’ve suspected lactose intolerance for a long time, ignored it with the hope that it’s something I get over (because who doesn’t love ice cream, cheese, butter, bread and baked goods, am I right? ), but it reared its ugly head big time last year. Much as it pained me, I followed my doctor’s advice and went cold turkey with that no-dairy thing. Of course, he did say it depends on my threshold for pain. That it’s up to me to decide what’s worth the bloat and cramps, and what’s not. I decided that I have to treat my body well. It’s the only one I’ve got. However, I really do miss baking. Trying non-dairy recipes seems like settling, but we’ll see. Blogging continues to be a labor of love for me. Some days, I still wonder if someone, anyone, is reading what I write and photograph. Then I remember that I myself enjoy looking back on the places we’ve been to and the food we’ve eaten. This blog became my archive that I share with everyone. There were days when I wondered how to bump up my social media follows. The mystery that is social media, I’ve been seeing new bloggers with so few posts yet they’re garnering high numbers! It made me think that maybe, just maybe, I should aim for that too. After all, I do receive e-mails from companies who sell social media followers to increase social media numbers (for the social media innocent, yes, followers can be bought!). I considered it for, at most, five minutes. Then I realized that I wanted organic followers. I wanted people who follow me because they really like my content. Sure, I go hashtag-crazy in Instagram, but you don’t pay for hashtags. This was my way of dipping my toes into the world of camping. What better way to do that than to go glamping? I’ve never ridden a Segway until this tour. It’s special to me because I actually had to get over my initial fear of falling splat on my face. Turns out it’s not really tough to ride. Once you get the hang of it, it’s pretty fun. When we stayed at Saybrook Point Inn’s Tall Tales Guesthouse for the first time, I had such a great time that I wanted to go back there while we were still there. And so we did! We stayed at the Main Inn during this visit. How is it possible that I’ve never encountered Sri Lankan cuisine? I lived and worked in New York City for a long time! Who knew I’d try it for the first time in Hudson Valley? This blog had the same look since 2014. 2018 rolled around and it felt like a great time to change it up, so I did! There you have it, another year of blogging completed. The past year was characterized by trying new things, not just trying new restaurants. I truly hope this blog will continue to evolve and I’d definitely love to share the new directions it will go. Thank you so very much to you, my dear readers, for dropping by every now and then. Time is precious and I sincerely appreciate the time you spend here. Anyway. . . 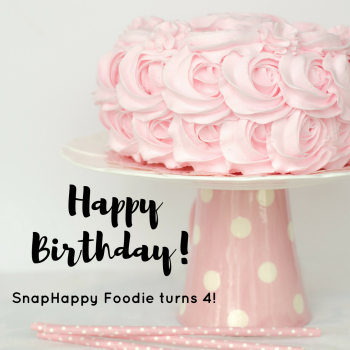 Happy blog birthday, SnapHappy Foodie! Cheers! You’re lactose-intolerant? Urg, sorry to hear that. Maybe you can still bake? How about lactose-free alternatives? Yeah, it’s alright. You get used to it, although I just make sure when I do something with dairy that it’s worth it. 🙂 The egg pie I made recently was made with flax milk. Still not the same as the usual one. I love following your food adventures and have always enjoyed the ones we’ve been on together! Looking forward to year five with you too! I wouldn’t have met you if not for my blog, Bonnie! It’s one of the best things that came out of this blogging adventure.